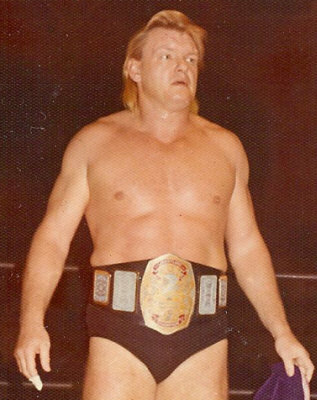 Color photos of the original Mid-Atlantic Heavyweight title belt are very rare. 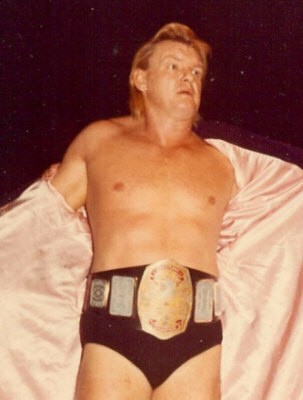 The photos below of Johnny Valentine wearing the original title belt illustrate better what this belt actually looked like. The main plate is two pieces, a nickel plated flange piece with a painted relief plate mounted to it. The relief plate is painted gold and red. The knight-head in the center is is not painted gold, and appears silver in color, and may be the polished zinc unpainted main plate. The paint color behind the two ribbons at top and bottom of the belt behind the words "WRESTLING" and "CHAMPION" is red. The side plates next to the main plate are polished zinc relief plates mounted on nickel plated flange pieces. 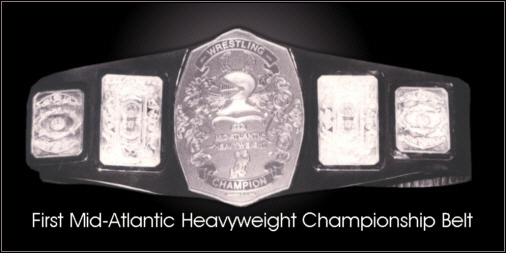 The original Mid-Atlantic Heavyweight Championship belt was made from the same art work used for the original Florida Heavyweight championship belt established in 1966, a design commonly known as the "knight head" belt. The only artwork difference in this Mid-Atlantic belt and the Florida belt was the word "Florida" changed to "Mid-Atlantic." The side plates were also identical to the side plates on the Missouri heavyweight title belt, also crafted around the same time as the Florida title.